Now here's a random thought for you ... this date, the 12th day of October, the 285th day of the year - or 286th if we're having a leap year - didn't happen in Italy, Poland, Portugal or Spain in the year 1582. That wily old Pontiff, Pope Gregory XIII, introduced a new-fangled date-tracking system that year, a small affair that became known as the Gregorian Calendar in his honour. His aim was to replace the old Julian calendar that everyone had previously been following with a new shorter year in order to stop Easter drifting later and later. The early Christian church had tied the celebration of Easter to the Spring Equinox, but given that the Julian calendar was just a bit too long to sit comfortably with the solar year, things were starting to get seriously out of step. So 0.02% of the year got shaved off to make sure that the Pontiff didn't have to wait for too long after the Spring Equinox for his Easter eggs. The Protestants and the Eastern Orthodox church were having none of this Papal messing about with time, so they held onto the Julian calendar for a few more centuries. Here in England we didn't actually take to the Gregorian Calendar until 1752. In Russia they clung onto their old calendar until 1918, and the Greeks didn't get around to changing things until 1923. Can you imagine the confusion that this double calendar system must have caused in the field of international trade? Down the centuries how many bills of lading must have specified consignment dates that didn't exist? And, by way of random time-passing photograph to accompany this post, I've attached a shot of Exeter Cathedral's beautiful clock, which is thought to have been made in 1484. Isn't it a beauty? It's a very early 24 hour clock. The fleur-de-lys, represents the sun, and travels around a dial of 24 Roman numerals, pointing to the hour. 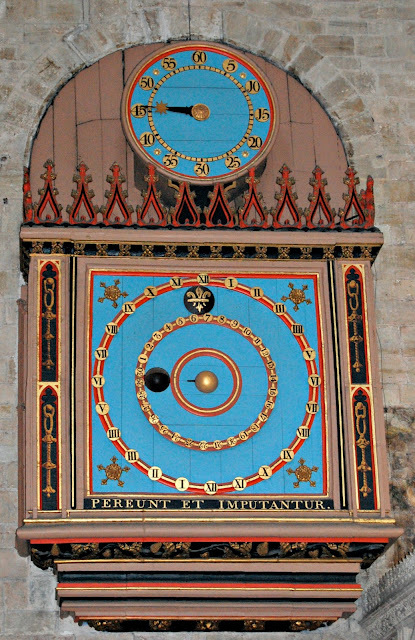 Note there are two sets of 12 hours, one in the first vertical hemisphere for the day, and the other in the second hemisphere for the night The tail of the fleur-de-lys points to the date in the lunar month, and the small dial above (a later addition) marks the minute. I love how so many early clocks only have an hour hand. Life was lived at a slower pace so I'm guessing the minutes counted as too much information! Anyway, here's to the day that didn't happen and to not worrying too much about those pesky minutes! It's fascinating, isn't it? :) You always share great pieces of history. Exeter Cathedral's Clock is stunning! Thanks for passing by, I am still in Italy. My mom has been in hospital since the end of Sept. :( Not sure when I'll be able to go back to Scotland and to my sweet hubby as my mom is not doing well at the moment and my dad is in a state of shock. Have a happy rest of the week, will pass by later to see more of your lovely posts.